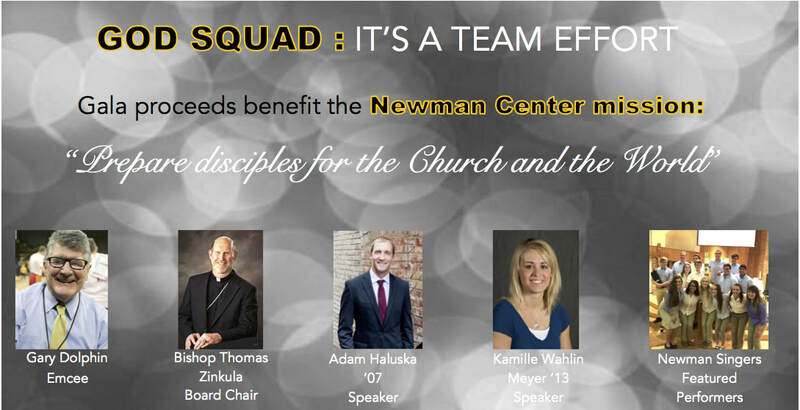 ​at the heart of the mission of the Newman Center! Seats are limited to the first 250 people, so purchase your tickets now! $75 per ticket. On purchase page, choose Gift Designation of "Other" and specify "Gala 2018" in the comments. Newman Center supporter and Voice of the Hawkeyes, Gary Dolphin, will be the emcee. Joining him on the dais will be Newman Center alumni Adam Haluska '07 and Kamille Wahlin Meyer '13, along with Bishop Thomas Zinkula. ​The Newman Singers will be featured, live and silent auctions will be held, and dinner & drinks will be served. Ways you can join the Gala FUNdraising! Buy 1 or 2 tickets (or more) & come join us for FUN! How will Gala 2018 proceeds be used? How many students are served by Newman Center? Why should I support the Gala? Newman Center's development director April Rouner is happy to answer any Gala or Newman Center questions you may have. Email April or call 319-337-3106 x 119.